Concerns have been raised in recent years about standards of care in the UK. Notable failures have been identified in the care of vulnerable older adults. 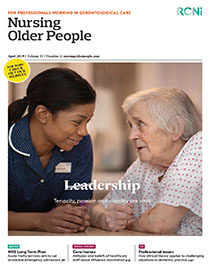 This article identifies and discusses some logical steps which might be taken to minimise the risk of individual and systemic care failure in settings for older adults. These steps include frank discussion about ageism to promote empowerment and respect for older people; ensuring robust policies are in place that support and encourage the reporting of poor care; and ensuring that registered practitioners are aware of their accountability for their actions and also their omissions should they witness poor care. In addition to reducing the risk of poor care, these steps could contribute to having a more confident, competent and empowered workforce.